After coming up just one game shy of the postseason, Attleboro is aiming to make the playoffs for the first time in program history in 2018. The Bombardiers doubled their victory total from 2016 to 2017, going from four to eight in the win column. Attleboro returns 11 players from last year’s squad and has a total of 12 seniors on the team. Now in its fourth year, interest in the program is growing rapidly with 17 combined freshmen on either varsity or the JV roster. There will be a lot of experience on the defensive end for Big Blue. Junior captain Trevor Koppy is back for his third year as the Bombardiers’ starting goalie. He turned away 306 shots last year with a 64% save percentage. In front of Koppy, senior captain Dan Perry is back to anchor the defensive unit which features all seniors. Perry is joined by classmates Jim Nordberg and Chris Reynolds on close defense while Matt Potter will man LSM and Matt Jiminez brins an extra long pole presence to the defensive unit. Another returner is senior Kyle Henry, resuming his role as the team’s primary faceoff man. Henry had a successful 2017 season in that role and Big Blue will rely on him to spark the offense once again. Seniors Jimmy Burke and Aidan McKenna, junior Cam Littig, and sophomore Thomas Shipman return to the midfield for Attleboro. Big Blue will have some new faces on the attack with seniors TJ Infante, Shane Joubert, and Aidan Downey leading the way. Freshman Mike Strachan and Matt Perry will also be involved in Attleboro’s attack. The Bulldogs found themselves in an unfamiliar position at the end of last season: on the outside looking in for the postseason. Canton is looking to get back into the postseason this year after coming up just one game shy of qualifying. The Bulldogs won three straight to give themselves a chance but fell just short on the road against Abington in the final game of the season. Using that as motivation, look for the Bulldogs to be right back in the mix this season. Leading the way will be senior captains Kevin Albert, Charlie O’Connor, and Griffin Roach. All three patrolled the midfield last season but could see time in other spots depending on how the lineup comes together. O’Connor will step in to handle faceoffs but could miss some time early along with defensemen Brian Ghostlaw and Brendan Albert. Until Canton gets back to 100%, it will rely on senior Gabe Galeotos, junior George Kent, and sophomores Nick Mackay and Jace Emma to provide protection in front of sophomore goalie Jack Connolly. Connolly had a superb freshman season in the cage for the Bulldogs and will try to build upon that his season. “We have a great group of kids this year with a nice blend of experienced players and new faces,” said CHS head coach Bill Bendell. It’s safe to say Foxboro head coach Matt Noone is optimistic about the 2018 season. The Warriors graduated just three players total and return their starting goalie, the entire defensive unit, and top three scorers from a season ago. Foxboro’s record was a bit deceiving based on how much talent they had, with five one-goal losses and two two-goal losses. The Warriors were dropped in the opening game of the playoffs by just one goal after holding a multi-goal lead in the second half. With so much of the line up back, Noone is hoping to turn those close losses into wins. It all starts with defense in Foxboro with Jake Addeche returning in the cage for his third season. Addeche (185 saves) is one of the best goalies in the region and will have a very experienced defense in front of him. Senior Pat Kaveny and junior Pat Stapleton will anchor the defense, both with equipped with plenty of skill and experience, while sophomores Ronnie MacLellan and Matt Lathrop each already have a year of varsity experience under their belts. Junior Brendan Tully (24 goals, 15 assists) will pace the Warriors in the midfield (“His lacrosse IQ is off the charts,” Noone notes). Tully can help transition Foxboro from defense to offense, and his ability to keep possession helps the Warriors control the tempo. Tully is complemented in the middle by seniors Louis Blake and Mike Collins while both Shayne Kerrigan and Bobby Yerardi will be in the mix as well. Offensively, the Warriors look to be well-balanced with Louis Piccolo (25 goals, 13 assists) back this year along with senior Mike Moses (18 goals, 20 assists), junior Pete Conley (15 goals, 23 assists) and senior Andrew Whalen. Expectations are high for the 2018 season based on the talent the Franklin Panthers boast this year. The long list of returning talent starts with All-American and 2017 HockomockSports.com Player of the Year Eric Civetti. Civetti (Rutgers commit) has been tormenting opposing defenses since his freshman year. He scored 70 goals and notched 24 assists as a sophomore, and then netted 79 goals and 21 assists last year, totaling 194 points between the two years. The Panthers will also boast senior Zach Alexander and freshman Matt Lazzaro on attack. The midfield will be loaded with two talented lines available. Captains Kyle McEniry (10 goals, 21 assists) and Chase Tanner (29 goals, 10 assists) will be joined by the speedy Nitin Chaudhury (24 goals, 10 assists) on the Panthers first unit while Jake Davis, Johnny O’Glishen, and Owen Palmieri give Verrochi an incredibly talented second unit. As if the midfield wasn’t loaded enough, the Panthers have 2017 HockomockSports.com Underclassman of the Year Jacob Alexander back to dominate the faceoff X. Alexander, who is committed to play at Bryant University, has dominated at the X for the past two years and really gives the Panthers an advantage in terms of getting possession. “He’s arguably the best FOGO in Mass,” Verrochi noted. The defense will be anchored by junior Patrick Morrison (Rutgers commit) along with Trevor Raffin, Jack McGrath and Spencer Briggs. Sean Lazzaro will be our top LSM while the Panthers have plenty of talent as SSDM with Will Harvey, Ben Kolb, and Aaron Mollo in the mix. Backstopping the team in goal will be Colorado commit and captain Connor O’Rourke (169 saves, 64% save percentage). The Warriors will be looking to replicate the success they had in the 2016 season again this year. After finishing 9-2 in league play (second in the Kelley-Rex), the Warriors had an impressive postseason run, competing with top-seeded and eventual sectional champ BC High in the D1 South Quarterfinals. A big reason why KP has had a lot of experience over the past four years is goalie Paul Macrina. Macrina is now manning the cage at Drexel University, so there are big shoes to fill in the cage this season for KP. King Philip also has to find replacements for the production lost by LSM Zach D’Amico, attack Tim Watson (56 goals, 28 points – second in the Hockomock League), and defenseman Connor Khung – the first two selected to the 2017 HockomockSports.com First Team and Khung apart of the Second Team. All is not lost though as the Warriors have junior Colin DeVellis back to spearhead the attack. DeVellis was fourth overall in the Hockomock League in points last season, scoring 22 goals and notching 36 assists (58 points). Another key piece will be senior Nate Minkwitz, who can make an impact on both ends of the field. Minkwitz had 13 goals and five assists last season and will aim to improve on that. Expect LSM Wesley Bishop and midfielder Aidan Bender to factor in this season as well. Mansfield returns a good amount of talent from last year’s playoff squad so the Hornets will certainly be looking to book a return trip as well as compete for a Kelley-Rex title. The Hornets return one of the most dangerous attackmen in the area in senior Hunter Ferreira. Ferreira’s combination of size, speed, and strength – as well as finishing ability – make him a must-watch for opposing defenses. Most will dedicate two defensemen his way but Ferreira still finished fifth in the league in points with 34 goals and 19 assists. Ferreira will be joined by returners Aidan Sacco and Mike Reed, giving the Hornets an experienced three-headed monster on offense. The midfield is also loaded with experience behind returning starters Joe Cox (19 goals, 14 assists) and Danny DeGirolamo (17 goals, 15 assists). Cox, who was named to the 2017 HockomockSports.com Second Team, muscles his way through opponents, while DeGirolamo can use his speed to cause problems. Haig Megerdichian, Brett Kessler, Connor Quirk, and Brad Grant will all see time in the midfield as well. Tommy Donnelly will anchor the defensive unit but the Hornets will have some new faces in back. Dan Plugis and Chris Copponi will both see a lot of minutes for the Hornets in front of goalie Jack Munroe, who stepped in last season and impressed in the cage. Milford hasn’t had a ton of success overall since it joined the Hockomock League, but new head coach Jacob Scordato is hoping to change that going forward. Scordato takes over a team that had just four wins a year ago and is the third coach in the past three years for the program. Although the Hawks don’t have an incredibly deep roster, the optimism stems from the experience returning on offense. UMass Boston commit and senior captain Andrew Gallagher (16 goals, 7 assists) will be a key weapon up front along with junior captains Ryan Hazard (41 goals, 10 assists) and Josh Ligor. Scordato also expects junior newcomer Brendan White, who has had successful football and basketball seasons so far this school year, to make a big impact on offense for Milford. Defensively, Milford will rely on senior captain and midfielder Chase Blanchette. North Attleboro graduated a lot of talent from last year’s squad, so it’s no surprise head coach Kevin Young believes this season will be a big challenge for his young squad. Although he expects it to be a challenge, the Rocketeers have built a strong program and will likely be in the mix for the division title with Foxboro. Big Red will be anchored by defenseman and captain Tom Lockavitch (Roger Williams commit) and senior LSM Max Fontes. Both Lockavitch and Fontes had tremendous junior seasons and were both honored by HockomockSports.com (first and second teams, respectively). Sophomores Brett Labonte and Will Yeomans will round out a strong defensive unit. One of the biggest tasks will be filling the void left in goal with Hock MVP and long-time starter Dan MacDonald now graduated. The Rocketeers have three goalies in the mix with Young noting all are working hard to claim the starting spot. Junior Jack Puccio and sophomores Nate D’Amico and Jake McNeany will all be in the mix. Captain Tommy Lindstrom (Springfield commit) will pace the offense with the help of sophomores Jack Connolly and Andy DeMattio. Faceoff specialist Jason McNeany (Cocker College commit) is also back and will be a key piece of the offense. Nick Ward, Damien Curtis, and Dan Conroy should carry the transition in the midfield with help from Ryan Rajotte and Matt McSweeney. Oliver Ames nearly made it two straight years in the postseason but came up just one game shy of qualifying in 2017. So the goal is simple for the Tigers in 2018: get back to the tournament. The Tigers return their top six scorers from last season, and now with a year more experience under their belts, should be ready to take on some of the top defenses in the league. Assistant coach Ben Devlin takes over the reigns of the program, and the familiarity should help make for a smooth transition. Senior captains Eric LeBlanc (30 goals, 13 assists) and Owen Gallagher will spearhead the attack while senior captain Jack Lang will make an impact on both ends of the field while also handling faceoff duties. Junior Colin Bourne and sophomores Sam Stevens and Shane Kilkelly give the Tigers varsity experience in the midfield. Sophomore Frankie Ireland and freshman Remi Creighton will also figure into the mix on offense. Devlin will have holes to fill on the defensive end but its excited about the skill that the Tigers have. Shane Murphy, Cullen Gallagher, and Matt Saba will be relied upon to carry the defensive unit while Rory Madden will handle LSM duties after missing last season. Nick Gillis will take over for Sean Cosgrove in net after impressing at the JV level. New head coach Jon Shocket is excited and optimistic that the 2018 season will be a successful one on the lacrosse field for the Sharon Eagles. Shocket believes the Eagles have the lacrosse IQ and skill to get back to the postseason after missing out on qualification by two wins. A big reason for the optimism is the senior class. The Eagles have experience at all positions on the field, starting with returning goalie Johnny Greenberg. Greenberg enters his third year as the starting goalie and will have good size in front of him. Both Sam Spencer and Coleman Loftus stand at 6’2 and look to be key pieces in the Eagles’ defensive unit. In the midfield, Jimmy Fitzhenry, Chase Waxman, and Spencer Hall give the Eagles a well-balanced and experienced group. The three provide a combination of speed, strength, and skill that will help Sharon transition from defense to offense. Junior Matt Callan will handle faceoff duties while freshman LSM Tyler Freidman will be in the mix as well. Senior Brett Litner brings a strong shot to the offense and will be tough to stop on the inside. Classmate Kadin Nestler gives the Eagles speed on the outside and makes the move from midfield to attack this year. Freshman Drew Litner rounds out the Eagles’ attacking unit. After winning four games in its inaugural season at the varsity level, Stoughton boys lacrosse is hoping to continue heading in the right direction this spring. The Knights picked up wins over Milford twice, Taunton, and Norton and will look to be in competition with those squads again this year. Leading the blue collar group will be captains Justin Ly, Sean Doherty, and Danny Nakhili. Ly is a three-sport athlete that is willing to do the dirty work, Nakhili provides a lot of leadership in the midfield and uses his speed to give the offense a boost, and Doherty will handle the faceoff duties and provide an offensive punch. Twins Nate and Alex Wilson bring skill to the long poles, Marty Barrett and Josh Cohen will be key pieces on defense, and Charlie Morgan, Luke Bainton, and Mike Tracey will all be in the mix offensively. “I’m hoping for more wins,” said SHS head coach Pat Healey said in an interview with Stoughton Media Access. “Last year we got four under our belt which is great for a first-year program. We brought up a lot of freshmen this year from the youth program. But baby steps, this is a tough league so we’ll do as best as we can. Now in its third year as a varsity program, Taunton is aiming to progress day by day to continue to build the program. The Tigers went without a win last season but bring seven starters back with another year of success on their belts. Junior goalie Ryan Williams returns in cage to give the Tigers a familiar face on the defensive end. Williams has been manning the cage for Taunton since the team moved to a varsity schedule. In front of Williams will be junior Justin Demoga, a captain, that handles close defense. Head coach Brendan Chambers noted Demoga is great with positioning, takes a great approach, and is willing to learn and improve every day. Chambers noted Demoga will be tasked with menacing opponents’ best attack throughout the season. In the midfield, junior captain Dylan Nichols provides leadership and experience for the Tigers. Nichols has the speed to make an impact on both ends of the field and Chambers is hoping for some offensive production out of the junior. Nichols will be joined by senior Chris Kanabayashi who will contribute to the offense with his hard shot. Junior Noah Kuczewski is making the jump from JV to varsity and will be one of the Tigers’ main pieces on attack. Chambers is also relying on junior captain Joel Delgado, who put a lot of time in during the offseason to improve, to be an important part of the offense. Mansfield, 10 @ King Philip, 28 – Final – Click here for a recap of this game. 1st Quarter: (M) Danny DeGirolamo 39-yard run, Mike DeBolt XP good. 2nd Quarter: (M) M. DeBolt 37-yard field goal; (KP) Shane Frommer 96-yard interception return, Cole Baker XP good. 4th Quarter: (KP) Brendan Lydon 19-yard pass to Dylan Leonard, C. Baker XP good, B. Lydon 31-yard pass to Thomas Madden, C. Baker XP good; S. Frommer 47-yard run, C. Baker XP good. Foxboro, 27 @ Canton, 21 – Final – Click here for a recap of this game. 2nd Quarter: (F) Mike Henri 5-yard rush, XP missed. 3rd Quarter: (C) Alec Ragusa 59-yard rush, Owen Lehane XP good. 4th Quarter: (F) Devin Hassett 13-yard pass to Jack O’Donnell, D. Hassett 2pt pass to J. O’Donnell; (C) Kyle Fitzgerald 2-yard rush, O. Lehane XP good; (F) D. Hassett 1-yard sneak, Russell Neale XP good; (C) Johnny Hagan 70-yard pass to Tony Harris, O. Lehane XP good. Overtime: (F) D. Hassett 6-yard pass to J. O’Donnell. 1st Quarter: (OA) Noah Fitzgerald 29-yard rush, XP no good; (OA) Anthony Berksza 15-yard rush, XP no good. 2nd Quarter: (F) Jake Noviello 20-yard pass to Jack Nally, XP no good; (OA) A. Berksza 19-yard rush, Curtis Cann 2pt pass to A. Berksza; (OA) C. Cann 34-yard pass to Ralph Derolus, A. Berksza 2pt rush; (F) J. Noviello 25-yard pass to Sean Leonard, J. Noviello 2pt pass to Evan Wendell. 3rd Quarter: (OA) Michael Mulrean 50-yard interception return, Derick Hanscom XP good; (F) Nick Gordon 4-yard rush, J. Noviello 2pt pass to S. Leonard. 4th Quarter: (OA) A. Berksza 7-yard rush, D. Hanscom XP good. 3rd Quarter: (Sto) E. Gibb 1-yard rush, E. Gibb 2pt pass to Ruben Gonzalez; (Sto) Jason Joseph 50-yard fumble return, XP failed. 4th Quarter: (Sto) J. Ly 1-yard rush, XP good. Foxboro, 2 @ Canton, 2 – Final – Click here for a recap of this game. Mansfield, 3 @ King Philip, 1 – Final – Mansfield built a 1-0 lead at halftime and added two more in the second half to pick up a win on the road at KP. Jackson Murphy opened the scoring on an assist from Sean Lanzillo to put the Hornets ahead. Cullin Anastasia scored what proved to be the game-winner with a penalty kick in the second half and then added an insurance goal on an assist from Sam Hyland. 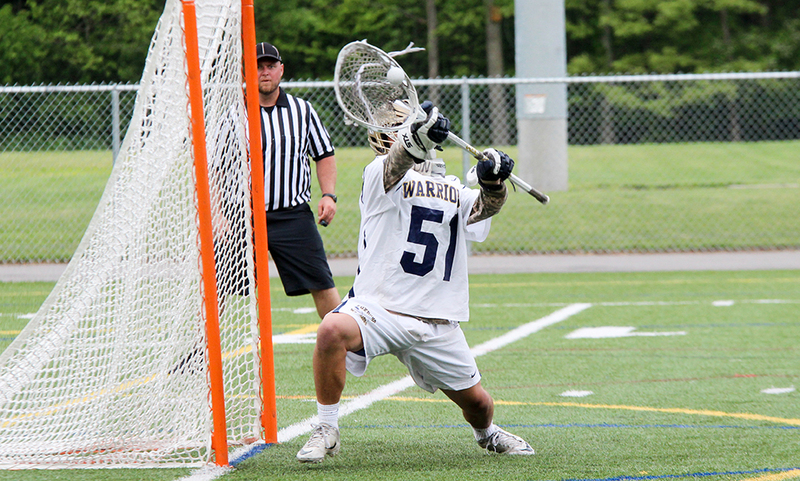 Mansfield goalie Nick Ferraz made 11 saves in the win. Milford, 1 @ North Attleboro, 3 – Final – North Attleboro scored all three of its goals in the second half to pick up a key division win over Milford. Big Red went up 1-0 when Gabe Pinhancos scored just under eight minutes into the second half, running onto a flick from junior Joe Hilf and converting. Pinhancos made it 2-0 just three minutes later, heading in a cross from Zach Matracia. Milford cut the deficit in half in the 62nd minute when Anthony Salvador volleyed in a throw from Joey Madden. Nate Burns put the game away with his first career goal, scoring off a flick from Connor MacIver. Oliver Ames, 3 @ Taunton, 1 – Final – Oliver Ames senior Matt Alvarado collected his third and fourth goals of the season, helping OA pick up two points on the road. Michael Nikiciuk netted his fourth goal of the season as well. Nathaniel Cardoza, Colin Evin and Cam Valla each had an assist in the win. Sharon, 4 @ Stoughton, 0 – Final – Sharon had four different goal scorers in the win on the road. Tyler Hippler, Andrew Reyes-Jones, Tyler Goldstein and Michael Baur each found the back of the net for the Eagles. Attleboro, 1 @ Franklin, 5 – Final – Franklin scored four times in the opening half hour to break the game wide open. Emily Mastaj, Halle Atkinson, Olivia Dellorco, and Sarah Yelle scored the goals for the Panthers before halftime and Molly Duncan added a fifth with five minutes left to play. Julia Hayes netted the lone goal for Attleboro. Breanna Atwood made five saves for the Panthers and Ashley Macia made five for the Bombardiers. Canton, 1 @ Foxboro, 2 – Final – Katelyn Mollica scored what turned out to be the game-winner with 12 minutes remaining to extend Foxboro’s win streak to five games. Shaina Abbott had the opening goal on a volley from a Mackenzie Fraser assist before Mollica doubled the lead. Canton cut the lead to one with a late goal, but the Warriors held on for the win. Jamie DeVellis made eight saves to earn the win in goal. King Philip, 2 @ Mansfield, 1 – Final – Avery Snead scored one and set up the other to lift KP to a win over the defending Kelley-Rex champs and put the Warriors into a tie atop the standings. Chloe Layne opened the scoring off a Snead assist in the first half, firing a low shot into the corner. Kerina Geminiani equalized for the Hornets with a 25-yard free kick that sent the game into halftime 1-1. Snead scored the game-winner with 11 minutes remaining, sending her shot just past the outstretched arms of the Mansfield keeper. KP coach Gary Pichel credited his “great defensive line” for helping the Warriors earn the two points. North Attleboro, 3 @ Milford, 0 – Final – North Attleboro scored all three of its goals inside the first half hour of the match and played a strong defensive game to earn the shutout. Ashlyn Gaulin opened the scoring in the 15th minute, converting a feed from Haley Guertin to make it 1-0. Guertin then doubled the lead off an assist from Kayla Pasquel before Emma Gaulin made it 3-0 in the 30th minute, with Leah Jette getting the assist. Emma Noreck made six saves for North to earn the shutout. Milford head coach Jay Mastaj said Briana Braza played well defensively for the Scarlet Hawks. Taunton, 1 @ Oliver Ames, 2 – Final – OA scored a pair of second half goals to come back from a goal down and pull out the win. Erin Holmberg scored off a through ball from Anna Tempestoso in the first minute after the break and Gabrielle McLaughlin netted the winner on an assist from Maeve Hogan. Samantha Tichelaar scored the lone goal of the game for Taunton in the opening minute. Alex Wapenski had the assist for Taunton. Stoughton, 2 @ Sharon, 6 – Final – Ally Filipkowski and Fallon Pfeifer both scored hat tricks for the Eagles and Filipkowski added an assist as well. Bridget McManus and Marika Fillon also had assists for Sharon. Stoughton got goals from Nicole Weir (off a cross from Brigid Pearl) and Mia Greene. Sharon, 2 vs. Bellingham, 2 – Final – Emily Locke scored both goals for the Eagles to earn the non-league tie. Foxboro, 173 @ Stoughton, 189 – Final – Foxboro’s Dylan Quinn earned match medalist honors, carding a low-round of 41 for the Warriors. Brendan Campbell shot a team-low round of 42 for the Black Knights. Attleboro, 197 @ North Attleboro, 198 – Final (5 cards) – It came down to a fifth card tiebreaker after rivals Attleboro and North Attleboro were knotted at 154. Kyle DelSignore led the Bombardiers with a par round of 35 while Corey McKenna carded a 38. Dylan Kane led North Attleboro, carding a 37 at the middle course of Heather Hill. Milford, 165 @ Canton, 156 – Final – Canton’s Jack Goyetch carded a round of 37 to earn match medalist honors and help the Bulldogs pick up another key division win. Joey Vaughan finished with a 38 and Bubba McNeice chipped in with a round of 40. Zach Tammaro and Andrew Fauerbach each shot 39 for the Scarlet Hawks. Sharon, 190 @ Mansfield, 171 – Final – Freshman Nathan Morreale carded a low-round of 41 while classmate Joseph Gormley shot a 42 to help the Hornets fend off visiting Sharon. Senior Brett Kessler, junior Jake DiSangro and freshman Brian See each carded a 44 for Mansfield. Oliver Ames, 8 @ Attleboro, 6 – Final – It was a back and forth battle between the Tigers and Bombardiers, with Oliver Ames prevailing behind three runs in the seventh inning. The Tigers grabbed the lead with three runs in the top of the first but Attleboro cut into the deficit with a pair of runs in the bottom half. Attleboro took a 4-3 lead in the fourth but OA grabbed a 5-4 advantage in the top of the fifth. The Bombardiers tied the game 5-5 in the bottom of the fifth and took a 6-5 lead in the bottom of the sixth. Oliver Ames took advantage of 10 walks on the day. Junior Matt Muir (2-for-5) drove in a pair of runs and the Tigers added an insurance run on a wild pitch to go up 8-6 in the top of the seventh. Cam Johnson was 2-for-3 with two RBI for OA while Alden Newman had a standout day behind the plate and went 1-for-3 with an RBI. Sophomore Chris Pearsons (RBI) picked up the win, coming on in relief in the sixth and didn’t give up a hit. Attleboro junior Jon Candiales (3-for-3) reached base four times and had an RBI double while sophomore Troy Van Vliet recorded a pair of hits for the Bombardiers. Sharon, 3 @ Canton, 4 – Final – Canton struck for a pair of runs in the third and then again in the fourth, holding off a Sharon rally late to pick up its first win of the season. A trio of sophomores stepped up to lead the Bulldogs. Matt Pigeon had a two-run single to pace the offense. Paul Corcoran earned the win, tossing five scoreless innings while classmate Rob Sullivan earned the two-inning save. Sharon’s Spencer Singer had a three-run double in the sixth to bring the Eagles within one. Foxboro, 2 @ Milford, 3 – Final – Milford senior Alex Macek had another strong outing on the mound for the Scarlet Hawks, going the distance without giving up an earned run. He scattered eight hits and struck out seven to earn the win. Offensively, he went 1-2 with a run scored. Milford scored all three runs in the third inning, junior Aidan Wilde going 2-for-3 with an RBI triple and Anthony Arcudi hitting 1-for-3 with an RBI for the Scarlet Hawks. Foxboro tacked on single runs in the sixth and in the seventh. Steve McLaughlin struck out five and allowed six hits in a complete game effort for the Warriors. Colin Thoener was 2-for-4 for Foxboro. Franklin, 6 @ Mansfield, 2 – Final – Franklin’s offense picked right where it left off from Wednesday’s walk-off win over Walpole. The Panthers pounced for three runs in both the first and second innings to take a 6-0 lead. Mansfield tacked on single runs in the fifth and seventh innings. Franklin junior Jason Ulrickson was impressive on the mound, giving up just one earned run on seven hits and just one walk in a complete game effort. Ulrickson also struck out five and had two RBI and a run scored on the offensive end. Jake Lyons (two runs) and Tyler Gomes (RBI) each went 2-for-4 for Franklin while Ryan Hodgkins (1-for-2) had an RBI and two runs, Bryan Woelfel had a two RBI single and Cam Lupien was 2-for-3 with a run scored. Mansfield’s Matt Farragher had an RBI single for the Hornets. Taunton, 6 @ King Philip, 4 – Final – Taunton overcame a four run deficit, scoring runs in the fifth, sixth and seventh innings to earn a key division win over King Philip. The Warriors plated a pair of runs in the second and the fourth innings. The Tigers cut the deficit in half with two in the fifth and took the lead with three runs in the top of the sixth. Taunton added an insurance run in the top of the seventh. With the game tied 4-4, Taunton senior Billy Emerson (1-for-2, two RBI) knocked in the go-ahead run with a single. Taunton sophomore Jack Moynihan (2-for-4, run) earned the win, striking out two with four runs allowed in six innings of work. Senior Danny Keogh got the save with a scoreless seventh inning. Tyler Medeiros and Jacob Crawford each went 2-for-4 with an RBI while David Schofield went 1-for-3 with two RBI and a run scored. King Philip’s Kyle Guenthner was 2-for-4 with two RBI and Chris Wing went 2-for-2 with an RBI and a run scored. Wing also struck out three in 5.2 innings of work, allowing three earned runs. Stoughton, 7 @ North Attleboro, 2 – Final – Stoughton’s Luke Johnson got the offense going early and Ryan Sullivan had a solid outing on the mound as the Black Knights battled the Rocketeers for the top spot in the Davenport. Johnson (3-for-4) connected for a two-out two RBI single in the top of the first to put Stoughton ahead. Evan Gibb had two hits, Ruben Gonzalez hit a solo home run and Jack Connelly knocked a two-run shot over the fence. Sullivan allowed just one earned run in six innings of work, walking two, allowing four hits and striking out five. Gibb pitched a scoreless, no-hit seventh inning with two strikeouts. Attleboro, 10 @ Oliver Ames, 8 – Final – Attleboro scored early and often, needed each run to take down the Tigers at Parkview Elementary. Big Blue pushed across five runs in the top of the first and added two more in the second to take a 7-1 lead. OA responded with four runs in the bottom of the second to cut Attleboro’s lead to 7-5. The Bombardiers never relinquished the lead and took a 10-8 decision. McKenzie Bergdoll went the distance in the circle for Attleboro, striking out seven and went 3-for-4 at the plate. Lead off hitter Jordyn Lako went 3-for-4 with two runs scored and Julya Woyton hit 3-for-4 with a three-run triple with the bases loaded in the first inning. AHS coach Mark Homer said Kayla Battisti made several stops at third base, helping to thwart OA’s comeback attempts. Oliver Ames’ Victoria Ziner was perfect at the plate (4-for-4, three singles, double) with three runs scored for the Tigers. Lexie Campbell (1-for-3) and Katie Abreu (3-for-4, double) had two RBI each. Rachel Han and Caroline Mahoney also each knocked in a run for OA. Canton, 4 @ Sharon, 9 – Final – Senior Sam Marglous provided the offense to help the Eagles pick up a second win of the season. Marglous went 3-for-3 with two RBI and a run scored. Alli Small, Rebecca Clayman, and Clara Cook each had hits and Sharon coach Deb Parker added that Small also played a strong defensive game at shortstop. Milford, 16 @ Foxboro, 4 – Final (6 inn.) – Milford and Foxboro traded runs in the third inning to make it 2-2 but Milford’s offense came to life, scoring three runs in the fourth and then exploding for 11 runs in the sixth. Emily Piergustavo (3-for-5, HR, two runs, four RBI) and Jess Tomaso (3-for-5, HR, double, three runs, three RBI) connected on back-to-back home runs to pace the Hawks’ offense. Kaitlyn DeCapua went 3-for-4 with two RBI and two runs scored, Emily Hartman was 3-for-5 with a home run, four RBI, a double and two runs and Shannon Cormier was 3-for-4 with an RBI and two runs scored. Mansfield, 5 @ Franklin, 4 – Final (9 inn.) – Mady Bendanillo scored the game-winning run for Mansfield in the top of the ninth inning on a sacrifice fly by Mackenzie Burke. Bendanillo slid in just ahead of the tag to give the Hornets the lead. Franklin put two runners on in the bottom of the ninth, but Sarah Cahill got the final two outs to earn the complete game win. Mansfield took a two-run lead in the top of the seventh. Megan Letendre reached on an error and Bendanillo was hit by a pitch, followed by back-to-back RBI singles by Marissa Staffer and Kerran Holmes. Franklin rallied with two in the bottom of the seventh to force extra innings. Kim Moulton (pinch hit) and Rachel Cousineau (3-for-4) had back to back singles. Olivia Haba tagged up for third and scored on an overthrow. Olivia DiGiacomo singled to score Cousineau. King Philip, 3 @ Taunton, 1 – Final – Taunton took the lead with a run in the bottom of the first, but King Philip responded with three in the top of the second and that was enough to pull out the win in a pivotal Kelley-Rex division game. Jess Bonner drove in one run and Elise Pereira had an RBI double and scored on a wild pitch, while Jenn Hutnyan allowed only one run on four hits to pick up the win for the Warriors. Courtney Fisher allowed two earned runs on three hits for the Tigers and Taunton coach Dave Lewry praised eighth grader Hannah Aldrich for a strong game defensively at shortstop. Aldrich had eight assists and three put-outs. MacKenzie Handrahan drove in the lone Taunton run. North Attleboro, 14 @ Stoughton, 0 – Final – North Attleboro freshman dazzled on the mound, striking out a career-high 14 batters, allowed just one hit and walked just two batters to help the Rocketeers blank Stoughton. Liz Morehouse paced Big Red’s offense, going 3-for-5 with five RBI. Olivia Capobianco and Andrea Miceli each had a pair of hits while Erti and Ashley Cangiano each scored a pair of runs. Canton, 13 vs. Milton, 0 – Final – The Bulldogs picked up their fourth straight win, blanking Milton in a non-league clash at Canton High. Eight different players scored at least one goal, led by sophomore Mike Shaw’s four assists and one goal. CHS head coach Bill Bendell said his side got great defense from their poles: Michael Pigeon, Brendan Albert, Nick Mackay, Gabe Galeotos, Brian Ghostlaw, Jona Sutton, Michael Yong and Brian Albert. Freshman Jack Connolly (three quarters) and senior CJ Martin combined for the shutout in net. Foxboro, 5 @ Mansfield, 4 – Final – Foxboro and Mansfield were tied after the first quarter (1-1) and tied at halftime (3-3). But Foxboro outscored the Hornets 2-1 in the third quarter and pitched a shutout in the fourth to edge Mansfield in the semifinals of the Chowda Cup. Andrew Whalen netted a pair of goals, including the game-winner in the third quarter. Bobby Yerardi, Brendan Tully and Sam Blake each scored once for Foxboro, who received 10 saves in net from goalie Jake Addeche. Foxboro head coach Matt Noone said Mike Collins and Lou Blake had strong games defensively for the Warriors. For Mansfield, Joe Cox had one goal and two assists while Cullen Murphy, Brett Kessler and Aidan Sacco each scored once. Sean Peters made 16 saves in net in front of a strong defensive effort led by Grant Milas and Josh London. Foxboro will play Catholic Memorial in the finals of the Chowda Cup on Saturday at Braintree. 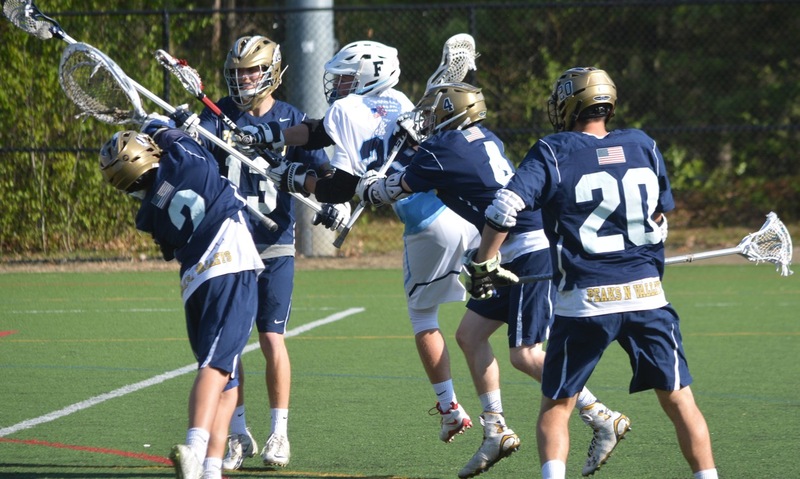 Franklin, 10 vs. Walpole, 11 – Final (OT) – Franklin rallied from a 8-5 deficit at halftime to take a 9-8 lead in the second half. After Franklin was whistled for an interference call, the Rebels tied the game with 1:27 to go. Walpole netted the game-winner with 38 seconds left in overtime. Eric Civetti had four goals and four assist, Chase Tanner had four goals and Kyle McEniry had one goal and one assist. Connor O’Rourke made 17 saves in net for the Panthers while sophomore Jacob Alexander won 18 face offs. Oliver Ames, 13 @ Pembroke, 14 – Final – Oliver Ames nearly overcame an eight goal deficit but fell just short on the road at Pembroke. The Titans jumped out to a 9-1 lead and held a 10-4 advantage at halftime. The Tigers won the second half 9-4 but came up just shy of tying the game. Liv Piazza scored five goals, Chloe Kilkelly scored four goals, Kendall Clifford and Sofia Masciarelli each had two goals for the Tigers. Mansfield 16, vs. Holliston, 6 – Final – Maire Foley led the way for the Hornets with five goals and Ann Maher added a hat trick. Mansfield also got two goals apiece from Lauren Whitman, Kathryn Garvin, and Mairead Dunn and 10 saves from Hannah Sternburg. Attleboro, 3 @ Oliver Ames, 2 – Final – Attleboro’s second doubles team of Hans Estrada and Luis Sandoval won in three sets, giving the Bombardiers the decisive third win to beat Oliver Ames. Estrada and Sandoval picked up a 6-2, 5-7, 7-5 win while Shawn Gordon won 6-0, 6-2 at first singles and Jared Cooper won 6-4, 6-4 at third singles. Oliver Ames’ Nick Cavanaugh 6-3, 6-0 at second singles and Greg Mueller and Michael Souza won 6-4, 2-6, 7-5 at first doubles. Canton, 0 @ Sharon, 5 – Final – Sharon dropped just one game in singles player and just two in doubles to get the sweep against Canton. Junior Andre Olivei won 6-1, 6-0 at first singles, sophomore Danujan Thirumavalavan won 6-0, 6-0 at second singles and freshman Alberto Olivei won 6-0, 6-0 at third singles. The team of seniors Alex Romantz and Sammy Kirshenbaum won 6-0, 6-2 at first doubles and the team of juniors Ashwin Sreevatsa and Artie Chinnappan won 6-0, 6-0 at second doubles for Sharon. Mansfield, 2 @ Franklin, 3 – Final – Franklin relied on its depth to pick up a win over Mansfield in a Kelley-Rex showdown. While Mansfield won at first and second singles, the Panthers claimed wins at third singles and both doubles matches. Freshman Rohan Herur won 7-6 (7-4), 2-6, 6-2 at third singles, James Johnstone and Derek Wu won 6-2, 6-3 at first doubles and Tyler DiPalma and Rahul Hosdurg clinched the match with a 3-6, 6-1, 6-2 win at second doubles. Mansfield’s Benny Lin won 2-6, 6-2, 6-4 at first singles and Luke Nickerson won 6-3, 6-4 at second singles. King Philip, 5 @ Taunton, 0 – Final – King Philip won all five matches in straight sets, dropping a total of six games on the road at Taunton. Cole Ginter won 6-0, 6-3 at first singles, Blake Ginter won 6-0, 6-0 at second singles and Marco DiStefano won 6-0, 6-0 at third singles. Ryan Gemelli and Sam Collela won 6-0, 6-1 at first doubles and Aidan Ignatius and Sean Desrochers won 6-2, 6-0 at second doubles. North Attleboro, 4 @ Stoughton, 1 – Final – North Attleboro picked up wins at first and second singles as well as first and second doubles to beat Stoughton. Zac Pfeffer won 6-0, 6-0 at first singles and Barsomo Nuay won 6-0, 6-1 at second singles for Big Red. Daniel Zhang and Ben Pfeffer won 6-0, 6-1 at first doubles and Brendan Hurd and Keigan Beaugh won 6-1, 6-2 at second doubles. Stoughton’s Erik Anderson won 7-5, 6-2 at third singles. Oliver Ames, 5 @ Attleboro, 0 – Final – Oliver Ames picked up a win on the road at Attleboro, winning all five matches in straight sets. Sarah Leger won 6-2, 6-0 at first singles, Mandi Miller won 6-2, 6-0 at second singles and Maura Kiernan won 6-0, 6-3 at third singles. The team of Tori Wyman and Kristin Bloumbas won 7-5, 6-1 at first doubles and Emily Yu and Ana Serjak won 6-2, 6-1 at second doubles for the Tigers. Sharon, 4 @ Canton, 1 – Final – Sharon picked up the win on the road, notching two wins at singles and two wins at doubles. Nupur Shukla won 6-1, 6-0 at first singles and Rithika Neti won 6-1, 6-0 at second singles. The team of Sydney Gordon and Lauren Glass won 6-0, 6-2 at first doubles and Sachi Bhasin and Makalia Cheung won 6-3, 6-3 at second doubles for the Eagles. Sharon forfeited the match at third singles. Foxboro, 5 @ Milford, 0 – Final – The Warriors went on the road and picked up an impressive win, dropping a total of five games between the five matches. Sophia Prinos won 6-0, 6-0 at first singles, Lexi Nelson won 6-0, 6-0 at second singles and Julia Muise picked up a 6-0, 6-1 win at third sinlges. Kayla Prag and Olivia Dantona won 6-2, 6-2 at first doubles and the team of Jacey Nicklas and Kendall Milender won 6-0, 6-0 at second doubles for Foxboro. Franklin, 2 @ Mansfield, 3 – Final – Mansfield picked up a big division win against the visiting Panthers of Franklin, winning at second and third singles as well as first doubles. Junior Sarah Doyle won 6-3, 1-0 at second singles and sophomore Elizabeth Elsner won 6-1, 6-4 at third singles. The team of senior Chloe Peters and sophomore Tessa Garufi earned the third win for the Hornets, winning 6-2, 6-0 at first doubles. Franklin’s Hannah Sweeney won 6-0, 6-2 at first singles and the team of Jillian McCaugh and Hailey Stier won 0-6, 6-4, 6-1 at second doubles. Now in its fourth year at the varsity level, Attleboro boys lacrosse is looking to take the next step in the 2017 season. First year head coach Kevin Koppy made it clear what the goal is for Big Blue: the postseason. Koppy has plenty of experience at the youth level so he’s very familiar with a lot of the players on the team. Offensively, seniors Seth Lombardy and Zach Viau, along with junior Alex Banner, will see a lot of time. They’ll be bolstered by the midfield help of seniors Andrew Milliken, Sam Carrado and Jay Mota and sophomore Zach Thomas in the midfield. Juniors Kyle Henry and Aidan McKenna will man the face off X while Jim Nordberg and Chris Reynolds will be long stick midfielders. Defensively, four year starter and captain Tyler Koppy will anchor the backline alongside juniors Dan Perry and Matt Potter. Sophomore Trevor Koppy returns as the starting goalie again this season. The Bulldogs will rely on its athleticism, and be bolstered by depth this season, having more players in the program this season than in the last couple of years. Canton looks to have one of its most athletic squads from top-to-bottom in recent years and will certainly be in the mix for the Davenport title after winning it twice in the past four seasons. Offensively, the Bulldogs lost one of the top scorers in the league and in program history in Ben O’Neill, but the good news is that four of the team’s six top point producers from a year ago are back: Ryan Lodge, Joe Mulkay, Dan Dillon and Mike Shaw, all of which reached double figures in points. Michael Pigeon has been one of the top LSMs in the league the last two years and will be a key piece for Canton defensively this season. Canton will rely on experience to fill the positions around him. The starting goalie spot is up for grabs between Dylan Cunningham, CJ Martin and Jack Connolly. “The Davenport division is wide open again this year so we know every game is going to matter…we can’t wait to get going,” said head coach Bill Bendell. The Davenport division looks like it will be wide open this year, but Foxboro could have a slight advantage because of the experience they return this season. On offense, junior Andrew Whalen is a three year starter and junior Louis Piccolo led the team in scoring a team ago. Junior Mike Moses and sophomore Pete Conley will also factor into the attack or could see time in the midfield. Seniors Trey Guerini and Colin Spinney not only bring a wealth of experience to the midfield, but they have a lot of talent. Sophomore Brendan Tully will relocate to the midfield this season while junior Sam Blake, Lou Blake and Mike Collins will all factor in the midfield as well. Defensively, it all starts with goalie Jake Addeche, one of the top netminders in the league and the area. Pat Kaveny is a two year starter, as is senior Padraig Farmer and will provide plenty of experience to the back line. Sophomore Pat Stapleton and freshman Ronnie MacLellan will also factor in defensively for the Warriors. The Panthers are going to be young compared to past years, and compared to other teams in the league, but what they lack in age, they more than make up in skill. There aren’t much better in the offensive end than junior Eric Civetti, and he’s only been in the league for two years. Already committed to Rutgers, Civetti will be one of the most dangerous scorers in the league. Senior captain Sam Arsenault will also be a top option in the offensive end while midfielders Packie Watson, a senior and Nitin Chaudhury, a sophomore, will also be viable options. Defensively, the Panthers have a second Rutgers commit in sophomore Patrick Morrison. Senior Wyatt Arsenault will give the backline some experience while senior Jack Platner will be the team’s LSM. Junior Connor O’Rourke is back in the cage after a breakout sophomore year. The Warriors had another strong season in 2016 and will be looking to do the same in 2017. King Philip was strong in league play, posting a 7-3 record and will try to carry that success over to its non league schedule, which include games against Bishop Feehan, Newton North, Hopkinton, Westwood and more. Paul Macrina has been one of the top goalies in the league over the past couple of seasons and is now ready for his senior year. Replacing leading scorer Sam Agricola will certainly be a tough test, as well as replacing the production of Harry Fallon. But Tim Watson (27 goals, 21 assists) brings a lot of experience back to the offensive end for the Warriors. Coming off one of the program’s best seasons in recent history, the Hornets will be looking to replicate that success in 2017. The challenge will be replacing some of the top talent that graduated, including midfielders Billy Grant and Connor Finerty, and defenseman Josh Schafer. The good news is that the Hornets return two of the top talents in the league with Sean Powers back in goal and Hunter Ferreira back patrolling the midfield. Joe Cox and Danny DeGirolamo will flank Ferreira in the midfield with Aidan Sacco, Brett Kessler and Brad Grant factoring in as well. Offensively, seniors Cullen Murphy, Sam O’Connell and Jon Reed will be one of the most experienced units in the league. On defense, Grant Milas, Mike Zampine, Josh London and Tommy Donnelly will hold court in front of Powers. “We are going to go out there this season and try to improve on the aspects we were weak on last season and just try to compete in every contest,” said head coach Tim Frias. The Hawks are hoping for a turnaround season after going without a win a season ago. First year head coach Doug Gallant has taken over at the helm and is looking to make Milford a participant in the Davenport race. The heart of the lineup could be in the midfield, with junior Andrew Gallagher bringing experience to the table and sophomores Ryan Hazard and Josh Ligor, as well as freshman Dan Farrell, providing the Hawks with skill and speed. In the attacking end, Gallant will look to senior Alex Wood and sophomore Ryan Pearl, both with varsity experience, to pace the offense. LSM Nick Lurie and defenseman Harrison Bliss will be key pieces on defense in front of goalie Drew Mirisola. After just missing out on the postseason a year ago, North Attleboro returns a lot of key pieces and will not only make a push for the playoffs, but should be in the mix for the Davenport crown. The entire attacking corps is back this season Zach McGowan, Owen Costello and Colin Young all back again this season. Tim Lindstrom, who missed last season with an injury, will also be a key piece offensively for the Rocketeers. Jack Dakin, the team’s leading scorer a season ago, will be a team leader from his midfield position while Nick Ward, Hunter Sarro, Nick Moore and Jason McNeany will all get minutes in the midfield as well. Poles David James, Zach Doucette and Tom Lockovitch, along with LSM Max Fontes, bring a combination of speed and size for the Rocketeers. Dan McDonald is back for another year in goal and will be like a coach on the field for North Attleboro. The Tigers not only made the playoffs a season ago, but won their first ever postseason game as a program. Oliver Ames will face new challenges this season with the switch to the Kelley-Rex division. While the Tigers face the task of going head to head with some of the top teams in the league, Oliver Ames will rely on team chemistry to try and get back to the postseason. Offensively, juniors Owen Gallagher and Eric LeBlanc are back as two of the team’s top point producers. They’ll be helped by midfielders Liam Brown, a senior captain, and Jack Lang, a junior. Defensively, senior captain Phil Saba and senior Max Howe are two experienced players that will man the space in front of senior goalie Sean Cosgrove. Sharon just made it into the postseason a year ago, punching its ticket on the last game of the season with a win over North Attleboro. This season, the Eagles are expecting to qualify for the state tournament again because of the experience they have returning for the 2017 season. Josh Rotman, who registered 35 goals a season ago, is one of the top midfielders in the league and will be relied upon to lead the Eagles this season. Spencer Hall and Chase Waxman are also back and should make an impact on both ends of the field. Jack Lesser has the ability to get forward and play as an attack or can drop into a midfield role. “We have a lot of guys with experience at this level returning, so we have set our expectations high,” said head coach Pete DeSisto. The Black Knights are the new kids on the block, entering their first year at the varsity level after playing at the JV level the last couple of seasons. Combining the JV experience and a budding youth program, Stoughton won’t be starting from scratch. However, the Black Knights are ready for what could be a roller coaster ride of a season. Leading the way for the Black Knights are captains Dave Cellucci, Ryan Pierri, Harry Leal and Matt St. Clair. Leal will anchor the team from the cage, Pierre is the leader of the team’s poles and Cellucci and St. Clair are standout members of the Black Knights’ midfield. “The team knows we’re going to be getting our share of bumps and bruises,” said head coach Pat Healey. “And winning here in the Hock is no easy chore. But it wouldn’t be much of a challenge if it was easy. After getting its feet wet last season, Taunton is looking to improve now in its second year at the varsity level. Sophomore goalie Ryan Williams was a bright spot for the Tigers a season ago and now, with a year under his belt, will an important part of the Tigers’ defense this season. Senior captain Mason Baacke and sophomore LSM Dylan Nichols will be key pieces in front of Williams. Offensively, Shawn Campbell will try to ignite Taunton from the face off X while senior captain Andrew Wellington, who had a solid season a year ago, will be a vital piece in the midfield for first year head coach Brendan Chambers. Attleboro, 0 @ Taunton, 3 – Final – Taunton scored a 25-22, 25-22, 25-14 victory, picking up its first league win of the season. Emily Moor led Taunton with eight kills, 14 digs and four aces while Delaney Powell had five kills, Abby Waldron had five digs, four kills and an ace and Kayli Fagan notched 25 assists, two kills, two aces and five digs. Stoughton, 0 @ Canton, 3 – Final – Aggressive serving from Maria Mackie helped Canton turn a two point deficit late in the second set into a two point win and the Bulldogs went on to complete the sweep, 25-22, 25-23, 25-16. Mackie, who had a steady night on defense as well, helped Canton turn a 23-21 deficit into a 25-23 win with her serving. Hannah Jerrier led Canton with eight kills, Casey Shea shined at the night with five kills and five blocks and Emma Murphy added three kills and five blocks. Julia Panico was an anchor for Canton’s defense while Nicole Poole was the glue for the Bulldogs with 21 assists and 15 digs. King Philip, 3 @ Franklin, 2 – Final – Franklin jumped out to a 2-0 lead but King Philip rattled off three straight wins to get the victory, 18-25, 11-25, 25-11, 25-20, 15-13. Sydney Phillips had a strong all around day to lead KP, registering 29 service points, three aces, 11 kills and seven digs. Carly Adams added 20 service points and 16 assists, Amanda Loewen had 24 digs and 15 service points, Michaela Palumbo added nine kills and Angela Vellante chipped in with 12 service points. Franklin’s Lauren McGrath had 23 assists, two kills and an ace and Erin Skidmore had 12 kills, eight aces, five digs and one block. Attleboro, 170 @ Mansfield, 164 – Final – Mansfield senior Jason Hindman earned match medalist honors, shooting a low round of 35. Brett Kessler chipped in with a 42 for the Hornets. Ethan Johnson and Corey McKenna each carded a 41 for the Bombardiers. Sharon, 185 @ Foxboro, 194 – Final – Sharon’s Max Avratin was the match medalist, shooting a low round of 44 to lead the Eagles. Matt Tierney paced the Warriors with a 47. King Philip, 158 @ Oliver Ames, 146 – Final – Oliver Ames’ Nick Lombardi shot a one-under par 33 to lead the Tigers. Mark Bissonette shot a 35 for OA and Nolan Donze and Thomas Walsh each carded a 39. Danny McLaughlin shot a 35 to lead KP while Sebastian Ladoulis shot a 39. Stoughton, 186 @ Milford, 159 – Final – Milford’s Ryan Tomaso continued his stellar season, shooting a 36 to lead the Scarlet Hawks. Milford’s Andrew Fauerbach carded a round of 40 to help the Scarlet Hawks. 2nd Quarter: (KP) Brendan Lydon 2 yard rush, Cole Baker XP good. 3rd Quarter: (KP) B. Lydon 1 yard rush, C. Baker XP good. 4th Quarter: (KP) B. Lydon 1 yard rush, C. Baker XP good. 1st Quarter: (S) Touchdown pass, XP good; (C) Alec Ragusa 5 yard rush, 2pt failed. 2nd Quarter: (S) Touchdown pass, XP good; (C) Dennis Ross 68 yard rush, 2pt failed, Scituate converts 2pt. 4th Quarter: (S) Touchdown pass, XP good. 2nd Quarter: (M) Blake Hill 13-yard rush, Sean Lehane XP good; (F) Jake Noviello 9-yard pass to Kinley Baird, K. Baird XP good. 3rd Quarter: (M) B. Hill 31-yard rush, S. Lehane XP good; (M) Asong Aminmentse 1-yard rush, S. Lehane XP good. 4th Quarter: (M) Matt Curran 11-yard pass to Tyler Joyce, S. Lehane XP good; (M) B. Hill 14-yard rush, S. Lehane XP good. 1st Quarter: (M) Joe Cox 2 yard rush, Diogo DeSousa XP good. 2nd Quarter: (M) Anthony DeGirolamo 1 yard rush, D. DeSousa XP good; (M) A. DeGirolamo 15 yard pass to Hunter Ferreira; XP blocked, Braintree converts 2pt. 3rd Quarter: (M) A. DeGirolamo 1 yard rush, D. DeSousa XP good; (M) J. Cox 4 yard rush, D. DeSousa XP good. 4th Quarter: (B) Braintree 25 yard rush, 2pt rush good. 1st Quarter: (NA) Chad Peterson 6 yard rush, Geoff Wilson XP good; (NA) C. Peterson 52 yard pass to Bobby Mylod, G. Wilson XP good. 2nd Quarter: (NA) C. Peterson 7 yard pass to B. Mylod, XP no good; (NA) Nick Rajotte 27 yard rush, G. Wilson XP good. 3rd Quarter: (NA) Nick Raneri 4 yard rush, G. Wilson XP good. 1st Quarter: (SL) Silver Lake 2 yard rush, XP good; (SL) Silver Lake 6 yard pass, XP no good. 2nd Quarter: (OA) Jay Fruci 1 yard rush, Anthony Berksza XP good. 3rd Quarter: (SL) Silver Lake 1 yard rush, 2pt failed; (SL) Silver Lake 25 yard pass, XP no good. 4th Quarter: (SL) Silver Lake 3 yard rush, XP good; (OA) Liston Funai 15 yard rush, Kyle Gagliardi 2pt pass to Brandon Timulty; (OA) L. Funai 3 yard rush, 2pt failed. 2nd Quarter: (CS) Cardinal Spellman 30 yard pass, XP good; (S) Drew Naisuler 56 yard pass to Austin Dodes, 2pt failed. 1st Quarter: (S) Justin Ly 1 yard rush, XP good. 2nd Quarter: (M) Brendan Ward 62 yard rush, XP good; (M) Jack McNeil 35 yard rush, XP no good. 3rd Quarter: (M) J. McNeil 32 yard rush, 2pt pass good. 4th Quarter: (S) Dave Cellucci 4 yard rush, 2pt failed. 3rd Quarter: (D) Durfee 20 yard rush, XP no good; (D) Durfee 7 yard rush, XP no good. 4th Quarter: (D) Durfee 20 yard fumble return off blocked punt, XP no good. Canton, 0 @ King Philip, 2 – Final – After a back and forth first half, King Philip assumed control in the second half. Thomas Lugten needed just three minutes to give the Warriors the lead early in the second half. Michael Rowe was tripped up in the area to draw a PK and junior Connor Mullins converted with less than 10 minutes to play to double the Warriors’ lead. Foxboro, 1 @ Franklin, 2 – Final – Click here for a recap of the game. Stoughton, 0 @ Mansfield, 2 – Final – Mansfield converted on a pair of first half chances to pick up the win over the visiting Black Knights. Brendan Sullivan put the home side in front in the 13th minute, converting a cross from Kevin Bouck. Sullivan then drew a penalty in the 39th minute and James Chotkowski buried it to make it 2-0. Jed Tolbert made six saves, recording his first career shutout. Head coach Steve Sheridan applauded the play of defenders Max Gurnon, Harry Braidt, Nick Hyland and Ethan Brill-Cass. Stoughton’s Brian Peoples had a strong performance, making his return for the Black Knights after an injury last season. North Attleboro, 0 @ Oliver Ames, 0 – Final – Oliver Ames hit the post three times and North Attleboro cleared two more chances off the line as the two teams battled to a scoreless tie at Muscato Stadium. Attleboro, 1 @ Sharon, 6 – Final – Ally Filipkowski and Alex Rabb both had hat tricks for the Eagles. Ally Steinberg and Anna Crosby both played well in midfield, according to Sharon coach Brad Furnival. Ashley Dame scored the goal for the Bombardiers. Mansfield, 7 @ Stoughton, 1 – Final – Hannah Reiter scored three goals and added an assist for the Hornets. Mansfield also got two goals from Emma Oldow, while Emma Goulet and Sydney Mulkern each scored once. Emily Vigeant had a pair of assists in the win. Stoughton’s goal was scored by freshman Chinazo Odunze off of an assist from sophomore Cintia Khouzami. Stoughton head coach Tara Daniels also made note of the defensive play of Sarina Hutchinson and Emerson Sprague. Oliver Ames, 3 @ North Attleboro, 0 – Final – Click here for a full recap of the game. Mansfield, 0 @ Bishop Feehan, 3 – Final – Mansfield was unable to overcome a slow start, falling to Feehan 10-25, 20-25, 22-25. Jess Haradon had 18 digs, Meg hill had seven kills and five blocks and Julia Harrison had six kills and 10 digs for the Hornets. Stoughton, 1 vs. Cardinal Spellman, 3 – Final – Stoughton senior captains Christina Gelin and Riley Bagley worked with Sophomore Mia Bennett to combine for over 70 digs. King Philip, 2 @ Attleboro, 0 – Final – King Philip had 14 corners and 13 shots on goal in a dominate effort, scoring once in each half. Alli Meehan scored the game winner just over midway through the first half. Nicole Conner iced the game with just 3:30 left, scoring off a corner from Christina Hathaway. KP allowed just one corner in the game and didn’t allow a shot on net. North Attleboro, 0 @ Canton, 3 – Final – Emily Campbell, Andrea McNeil and Maggie Wade each scored once in Canton’s win over North Attleboro. Sharon, 0 @ Foxboro, 10 – Final – This was the 150th career win for Foxboro coach Melissa Bordieri. Oliver Ames, 3 @ Franklin, 3 – Final – Franklin put up a pair of goals to go into halftime with a 2-0 lead but Oliver Ames came storming back in the second half. Brayden Downing opened the scoring off an assist from Cassie Ronan and Maddie Hinckley netted her first goal off a feed from Kayla Marshall to give the Panthers a 2-0 lead. Dimitra Efremidis brought OA back within one eight minutes into the second half and Kendall Clifford scored off a corner to tie the game. Dana Lewandowski put the Panthers back ahead midway through the second half off an assist from Maeve Ledwith but OA had an answer again. Liz Nuss scored on a breakaway with just over eight minutes to play to tie the game. Christina Lucini had four saves in net for Franklin while Katie Vamosi had a strong day in the cage for OA. Milford, 0 @ Stoughton, 1 – Final – Jackie Evangelista scored the lone goal of the game for Stoughton off an assist by Mia Russell. Gianna Barbosa had the shutout in goal in her first varsity start. Mansfield, 156 @ Canton, 146 – Final – Canton senior Matt Minichiello continued his strong start to 2016, earning match medalist honors at Blue Hills by carding a 34. Jack Goyetch shot 36, Danny Powers carded a 37 and Joey Vaughan chipped in with a 39 for the Bulldogs. Jason Hindman led Mansfield with a 35 while Brett Kessler added a 39 for the Hornets. Sharon, 173 @ King Philip, 160 – Final – Sebastian Ladoulis earned medalist honors, carding a low round of 38 for the Warriors. Jack Citarell shot a career-best 39 while freshman Nate Ihley impressed by carding a 40 on the day. North Attleboro, 146 @ Oliver Ames, 139 – Final – In a one of the best matchups of the season, Oliver Ames edged North with the top eight players all coming in under 40. Junior Matt Kelley was the match medalist, carding a two-under pass round of 32 at Pine Oaks in Easton. Thomas Walsh shot one over par at 35 while Brady Allbritton and Ryan McGarry each had a round of 36. North Attleboro’s Robbie Congdon carded a one-under round of 33 while Dylan Kane and Thomas Puccio each shot 37 and David Colsanti finished with a round of 39.